Near the end of the worst week of her latest bid for the presidency, Hillary Clinton tried on an unexpected, if all too familiar, guise: underdog. "I know what it's like to run from behind in New Hampshire," she told supporters Friday night in a Concord hotel ballroom, her voice rising to overpower the applause. "And I know what it's like to come from behind and win in New Hampshire!" Just as she had eight years earlier in her race against Barack Obama, the putative front-runner had again fallen behind an upstart senator who had excited and ignited the Democratic base. Days before her return to the Granite State, a CNN/WMUR poll had shown her trailing Sen. Bernie Sanders (I-Vt.) by a shocking 27 percentage points, while other surveys showed the two tied in Iowa. Here in Concord, however, Clinton was among friends. Arrayed around her were women young and old — plus a smattering of men — who had gathered to celebrate the 43rd anniversary of Roe v. Wade at NARAL Pro-Choice New Hampshire's annual dinner. Shortly before Clinton delivered her remarks, Sen. Jeanne Shaheen (D-N.H.) stood by her side and reminded the crowd of how Sanders had dismissed the organization on MSNBC earlier that week as part of the Democratic "establishment." "Now, I know my Senate colleague, Bernie Sanders, was disappointed not to receive the support of Planned Parenthood and NARAL," Shaheen said as Clinton looked on with a steely smile. "But when he points to the people in this room and he declares that you are what's wrong with America and part of the establishment that he's up against, he is just dead wrong." 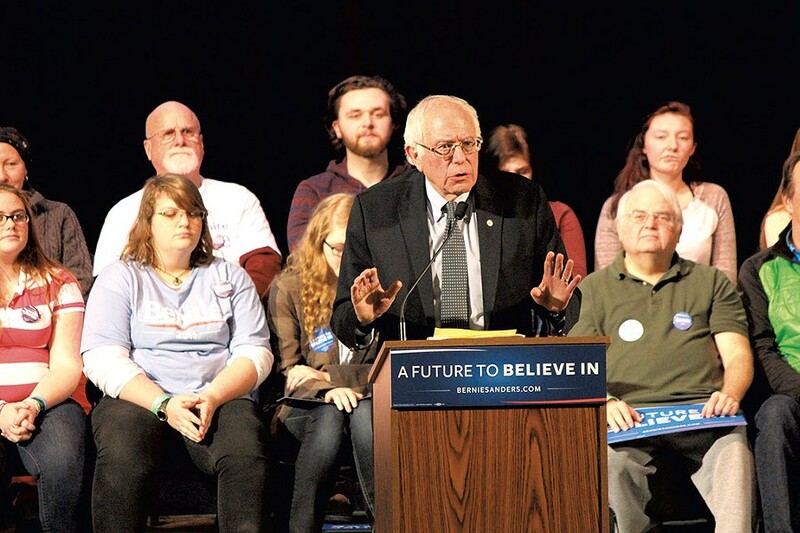 Speaking earlier that day in the shadow of the White Mountains, Sanders had reaffirmed his commitment to abortion rights, declaring at a jam-packed North Conway community center, "Nobody will be a stronger defender of a woman's right to choose than Bernie Sanders." But at the NARAL dinner in Concord, Planned Parenthood volunteer Natalie Moser said she wasn't buying it. "I think that he is a very honest, kind of down-to-earth guy, but he's not vocal enough about reproductive rights or women's health in general," she said. "I just haven't heard enough from him to support him in the primary." Throughout her visit to New Hampshire that day, Clinton tried to seed such doubts about her opponent: that he was insufficiently committed to women's rights, that he lacked her understanding of foreign policy, that he would scrap the successes of the Affordable Care Act and that he'd hand the presidency to a Republican. "The stakes in this election are really high," Clinton said Friday afternoon at the start of a town hall meeting in Rochester. "And they're high because we have to make a fundamental decision: Are we going to try to build on the progress that we've made under President Obama — or are we going to rip it up and start all over again?" "Build!" a woman shouted from her seat in the Rochester Opera House. "We're gonna build," Clinton agreed. "We're gonna build. That's what I believe with all my heart." Susan Hoover, a retired Nashua resident and longtime Clinton supporter, watched with admiration from her balcony seat. "I'm a big supporter of just about everything that Hillary talks about, whether it's gay rights or women's rights or the environment or keeping our country safe. I can easily see her as commander-in-chief," Hoover said. "I think Bernie Sanders talks very loudly, and he has one issue. I think Hillary is knowledgeable on every issue." Even as Sanders picked up steam over the last six months, Clinton until recently could count on women and seniors such as Hoover to support her. But a CBS/YouGov poll released Sunday indicated that, even among those demographic groups, Sanders now led. In New Hampshire, the survey showed, women backed Sanders over Clinton 57 to 38 percent — and those 65 and older split 59 to 38 percent in his favor. Rebecca White was just the sort of voter on whom Clinton could once rely. The risk management director from Chelsea, Vt., voted for her in 2008 and donned a Clinton sticker at Friday's NARAL dinner. But White quietly confessed that she thought, "Her time has passed, honestly." "As a woman, I do like Hillary very much, because she speaks about women's issues," she said. "But Bernie, really, has so much passion and is just so fantastic ... She's so much more status quo and [part of] the establishment." During his own two-day swing through New Hampshire last week, Sanders sought to convey that very contrast. "We have had enough of establishment politics, establishment economics," he said Thursday night in the Lake Winnipesaukee town of Wolfeboro. "We need to move in a new and bold direction." At each of his appearances — from Peterborough to Bedford — Sanders dwelled on a relatively new argument for his nomination: that he was better equipped than Clinton to defeat the eventual Republican nominee. "One of the things that my opponent, Secretary Clinton, is saying is that, 'Bernie Sanders is unelectable. 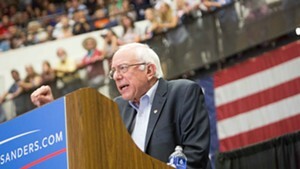 He just cannot defeat a Republican candidate in a general election,'" Sanders said at Wolfeboro's Kingswood Arts Center. But according to recent polls, he told the crowd, he had outperformed Clinton in hypothetical matchups against such GOP candidates as Sen. Marco Rubio (R-Fla.) and Ohio Gov. John Kasich. "And here is my favorite, because it deals with my good, good friend, Donald Trump," the senator said sarcastically. "Secretary Clinton defeats Mr. Trump by nine points. We beat him by 23 points." After affirming his antiestablishment bona fides and arguing for his electability, Sanders segued in each of his New Hampshire addresses back to his tried-and-true stump speech: heavy on policy prescriptions and light on electoral intrigue. "So I start my remarks — of course, I've gone on for 15 minutes — but let me start," Sanders joked after one such extended introduction. "It also takes me a long time to end, you know?" Then he was off on a tear about income inequality. So much has changed in Sanders' campaign operation since he launched it last April with a single full-time employee. Now hundreds of staffers scattered across a dozen states are signing up volunteers, training caucus-goers, running advance for Sanders' public events and expanding his digital footprint. Last week, a big blue campaign bus emblazoned with his logo chugged across Iowa for the first time — and, on Saturday, he flew in a chartered jet from Burlington to Des Moines. But Sanders' campaign rallies remain simple affairs: just a man, a podium and a whole mess of outrage. "Please don't tell me that the United States of America, our great country, cannot guarantee health care to all people as a right," he said Thursday night in Wolfeboro as he wound up an hourlong address. "Don't tell me that we cannot make certain that all of our young people, regardless of the income of their families, are able to get a college education if they have the ability to do so." "Don't tell me," Sanders continued, that the country cannot provide better workforce training or reduce income inequality or rebuild its crumbling infrastructure or adopt a fairer tax code. "When we stand together, there is nothing we cannot accomplish," he said. "That is what this campaign is about, and that is what a Sanders administration will be about. Thank you all!" As the crowd cheered, David Bowie's "Starman" piped through the PA, and Sanders disappeared into the night. On their way out of the Kingswood center, audience members gushed about what they had just seen. "I thought it was inspiring," said high school teacher Sarah Hunt, who voted for Clinton in 2008 but was now leaning toward Sanders. "Bernie has the sense of something different, so that's kind of exciting." "It was incredibly powerful," said Joie Milbourn, a high school sophomore from Ossipee who said she "really wish[ed]" she was old enough to vote for Sanders. "It was amazing," echoed Milbourn's friend, Gwyneth Anderson of Brookfield. "I love him so much. He's so great." Matthew Boulanger, who described himself as an "underemployed marine biologist," did not seem inclined toward such superlatives. But after watching videos of Sanders' speeches from the 1980s and '90s, he said, he'd become convinced that this candidate was the genuine article. "I think he actually, truly means what he says," the Gilmanton resident said. "I think, for the first time in my life, I believe that." That sort of enthusiasm could carry Sanders over the finish line Monday at the Iowa caucuses — and eight days later in the New Hampshire primary. But Clinton is hoping that her more practical argument will prevail. 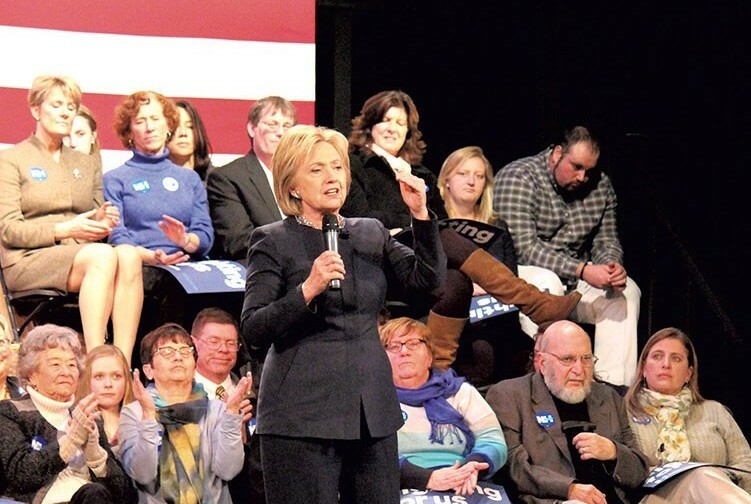 As she addressed her supporters Friday afternoon at the Rochester Opera House, Clinton alternated with ease between mimicking Sanders' populist message and questioning his efficacy. "What about the big institutions, the big forces, the special interests? Well, they're out there. They are out there," she said, summoning her inner Sanderista. "It makes me angry that there is so much power invested in so few people and institutions." To combat those special interests, Clinton continued, Democrats would have to wage a "smart" campaign to make gains in Congress. "And I think, if we have the right presidential candidate, we have a really good chance of taking back the Senate," she said in a not-so-subtle dig at her opponent. "At the end of this process, we need a president who can do all aspects of this job," Clinton said as she concluded her remarks. "There's no way to avoid it. Somebody's going to walk into that White House on January 20, 2017, right?" "And I hope, with your help, that will be me," she said.